There is a small room in your Naples-area home that can really make a big impact on the appearance and energy of your home—especially for guests. It’s your powder room! 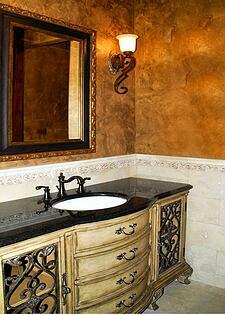 Often when homeowners remodel a master bathroom, they’ll go all out to make it comfortable and attractive. But when it comes to the powder room or guest bath, they settle for boring. But the small size (and location) of a powder room makes it fair game to try something bold and daring. Bold colors and patterns that would overpower a larger room can look terrific in a small space like the guest bath. Unusual or funky fixtures and furniture can really create a fun atmosphere in this small space. Part of what gives you the freedom to try something new is that the powder room is really a one-off kind of room. It stands on its own, so it doesn’t necessarily have to blend with anything else. The powder room is almost like a mini-retreat—visually—from the rest of the house. In terms of design, you can be playful and creative in this space without disturbing the overall look of the rest of your home. You can experiment with unusual sinks that come in a variety of shapes, colors and materials. You could try countertop materials that add color and interest but that you’d never dream of using in your kitchen (or your master bathroom). You can use bright, bold colors and patterns if you like. Or you could try unusual lighting fixtures or window treatments. If you want to see how some of these ideas actually work, check out houzz.com’s collection of fun and funky powder rooms. Do you really have to go wild with your powder room? Of course not! But it’s one room in your home where you can experiment with styles you might not dare to attempt elsewhere. You know what fits your sense of style and what makes you comfortable. But if you ever get the itch to do something a little outlandish with your home (on a small scale), the powder room may be the perfect place to try it. After all, who ever said bathrooms have to be boring?